An MBA with a focus on sustainability | Be Nice. I had the pleasure of watching this video on MSNBC today, and wanted to share it with you. The news feature profiles a couple who invested their entire retirement to start an MBA program (accredited!) that has a focus on sustainability. And their dream is working – their graduate students work at huge corporations. Imagining the impact this could potentially have on our future, it is inspiring and exciting. Let’s all hope it catches on. 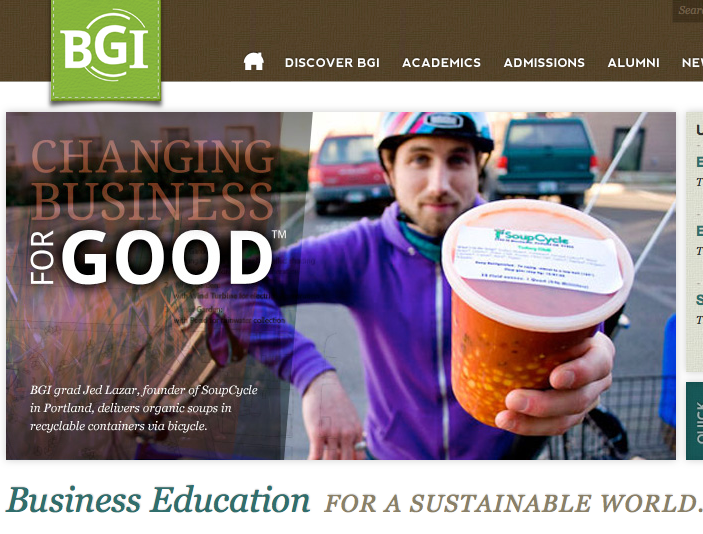 Learn more about the Bainbridge Graduate Institute. This entry was posted in Perspectives on Be Nice. and tagged Bainbridge Graduate Institute, business, environment, sustainability by Jen. Bookmark the permalink.